If you've got fans of BLT sandwiches, chances are good they'll enjoy this quick and tasty salad, too. Cook and stir bacon in medium skillet until crisp. Remove bacon from skillet with slotted spoon, reserving 1 Tbsp. drippings. Drain bacon on paper towels. Add dressing to reserved drippings; cook and stir with whisk on medium heat 2 min. or until heated through. 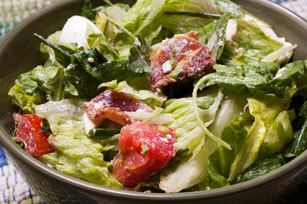 Toss lettuce with bacon and remaining ingredients in large bowl. Add hot dressing mixture; toss to coat. Serve immediately. A tasteful twist on a classic sandwich, this easy-to-make salad can be enjoyed on occasion.